Jefferson's has recently put out a couple of incredibly fancy-looking, and incredibly pricy bottles of bourbon finished in highly acclaimed or rated ex-wine casks. In addition to this Sauternes finish, they also shortly thereafter released a bourbon finished in ex-Pinchon Baron casks. I'll admit, the fancy packaging absolutely drew me in. I also know that I am prone to really liking wine-barrel finished bourbons. Though some are better than others, certainly, for the most part I haven't found one I didn't enjoy. So, despite the hefty price tag, I nonetheless wanted to give this a try. 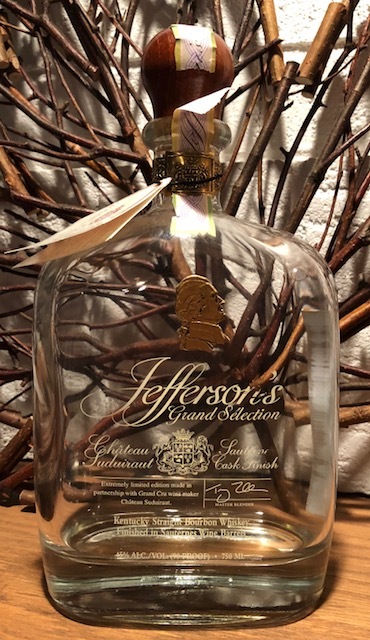 After all, Jefferson's, although they do like to experiment, have also become a brand that I trust and am willing to give the benefit of the doubt. The nose, as expected, is fruity and sweet. The wine notes are immediately prevalent and pungent, noticeable from a few feet away as soon as I popped the cork. They gave off notes of strawberry and dark cherry, but also the sweetness of honey. Much of this seemed to mask the traditional bourbon notes on the nose, however. The palate is likewise sweet and fruity. It's heavy on the raspberry notes, mixed with a whole bunch of vanilla bean. It reminded me of those vanilla ice cream cups that have the raspberry swirl in them. It's that sweet and that noticeable. In fact, the bourbon notes were very much buried in those first few pours. I really struggled to find them, and, though I really wanted to enjoy it, I just found it hard to do so. However, as this bottle was allowed to sit for a while after being opened, it did seem to transform. The sweetness died down a bit, and some of the traditional bourbon notes came through. It reminded me more now of those raspberry fruit strips that you can get a Trader Joe's or Whole Foods—the kinds with no artificial sweeteners in them. It was like unsweetened raspberry jelly. While it was good and had solid influence from the wine, it still just wasn't what I look for in a wine-finished bourbon. The influence was almost too heavy on this one for me. It just wasn't what I was hoping for. That being said, I've got bourbon-loving friends that I know would absolutely love this product, and this is just one of those that whether it's loved or not is going to completely depend on the individual drinker.